ATLANTA -- Alabama locked up another title, with plenty of style points for the playoff committee. Now, the Crimson Tide can go after the crown it really wants. Blake Sims threw a pair of touchdown passes, T.J. Yeldon and Derrick Henry each had a couple of touchdown runs, and top-ranked Alabama pulled away in the fourth quarter to win its 24th Southeastern Conference championship with a 42-13 rout of No. 14 Missouri on Saturday. Amari Cooper did nothing to hurt his Heisman chances with 12 receptions, the most in the game's 23-year history. Missouri made it a one-score contest in the third quarter, but Alabama (12-1) put up three touchdowns over the final 15 minutes to lock up its spot in college football's inaugural playoff. And if the committee was impressed by second-ranked Oregon's 51-13 rout of Arizona in the Pac-12 title game Friday night, they got another equally dominating performance from the team on top of its latest rankings. For coach Nick Saban and the Tide, this one was especially sweet. A year ago, Alabama was poised to make a run at its third straight national title when Auburn won the Iron Bowl on the final play -- a 109-yard return of a missed field goal. The sting from that one will never totally go away, but this sure helped. Even though plucky Missouri (10-3) hung around much of the game, the Tide can book a trip to New Orleans for a likely semifinal game in the Sugar Bowl. Alabama was ranked No. 1 by the playoff committee after winning the brutal SEC West. By knocking off the East champion, the Tide made it three SEC titles in Saban's dominating eight years as coach, a run that increasingly looks like the second coming of Bear Bryant in a much more competitive era. Cheered on by a predominantly crimson-clad crowd at the Georgia Dome, Alabama started out like it was going to run Missouri right out of the building. With offensive co-ordinator Lane Kiffin calling a bunch of short passes and runs to deal with Missouri's pass rush, the Tide went 68 yards in 10 plays -- never even going to third down -- to seize a 7-0 lead less than 4 minutes into the game. Missouri, which reached the title game for the second year in a row despite an ugly loss to Indiana and a 34-0 blowout at home by Georgia, managed to stay in the game thanks to Maty Mauk's deep passing. He completed throws of 63, 47, 32 and 26 yards, one of them after a Johnny Manziel-like scramble in which he threw back across his body running to his left. 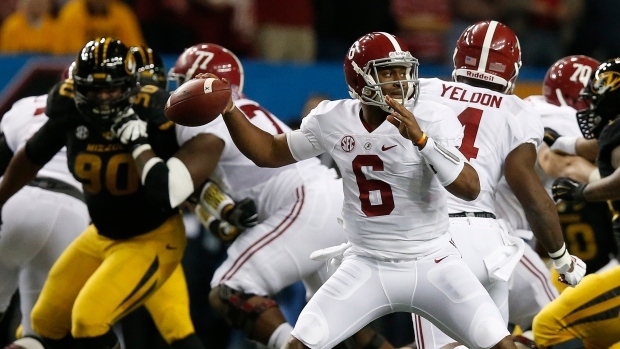 It was not nearly enough against the Crimson Tide juggernaut. Sims, named the game's MVP, pushed Alabama to a 14-0 lead with a 58-yard touchdown pass to DeAndrew White. On the first snap of the fourth quarter, the fifth-year senior who waited so long for his chance to start at quarterback hooked up with Christion Jones on a 6-yard TD that stretched the lead to 28-13. For good measure, Henry tacked on a couple of touchdown runs to make it a rout. He finished with 141 yards on 20 carries. Sims was brilliant, completing 23 of 27 for 262 yards. He went out for Alabama's final possession, then was pulled after one play so he could be saluted by the crowd. He gave Kiffin a long hug when he got to the sideline.